I could see getting lost in a conversation regarding astrophysics, but I need to step up my game if I ever want to hang with Neil deGrasse Tyson. Who would think that the Director of the Hayden Planetarium could be so freakin’ cool? Every time I come across a television program that he is appearing on (most recently on a “Real Time with Bill Maher” rerun), I can’t help but be drawn in. He really excels in his role as a science communicator, and at connecting with people in general. So you could imagine how psyched I was when I read that Venus Fallen drew inspiration from Tyson for its “Exploration” t shirt. 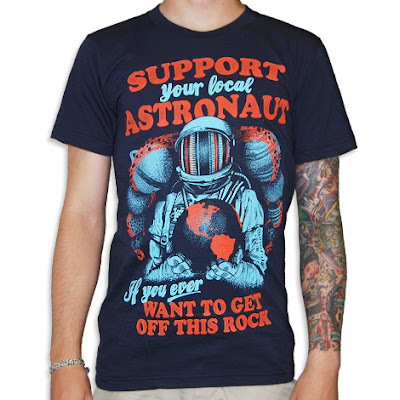 Express your desire for cosmic exploration and appreciation with this and other fantastic t shirts and outerwear available over in the Venus Fallen webstore. 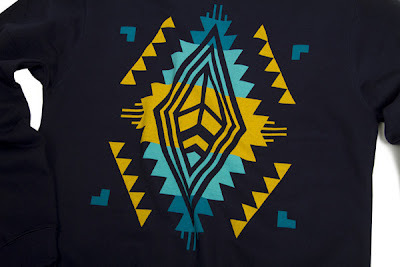 These Native American inspired prints are really growing on me. This crewneck sweatshirt is my favorite piece from Benny Gold‘s Valencia Collection Native Series. It looks perfect for chilly summer nights sitting around a campfire or on the beach. There are two recurring trends that I really admire in Benny Gold’s collections. It’s genius the way he incorporates the paper plane icon into all of his pieces, creating real brand cohesion. Secondly, almost every collection has at least two corresponding pieces, such as a crewneck sweatshirt and hat, or a t shirt and jacket. The Valencia Collection Native Series contains a wide selection of coordinating pieces available in the same print and color – a 5 panel hat, t shirt, crewneck sweatshirt, socks, and even a cruiser skate deck. There are even three different color options for all these items, with the exception of the crewneck sweatshirt. You can purchase them in Benny Gold’s online shop, or at a local dealer. Just a head’s up, though – these are selling out fast! 21st Amendment Brewery "Hop Crisis"
Took off work today so I could head into Philadelphia to celebrate Philly Beer Week, so I figured it was only fitting to write about a t shirt sold by a brewery. I haven’t tried 21st Amendment Brewery‘s Hop Crisis yet, but their Brew Free or Die is among my favorite canned beers. This t shirt is pretty intense for brewery swag. 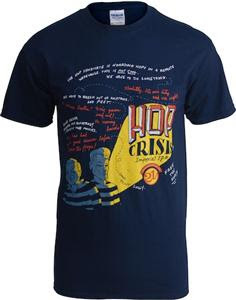 Rather than just slapping the Hop Crisis wordmark in the center of the chest, they went with an oversize print of the can art that really looks good. The colors work really well together, and the addition of a back print is also impressive. Cheers!